Bushwick and East Williamsburg have played a supporting role to many local film and television productions recently. Just this summer, "Mozart in the Jungle," "Homeland," "The Deuce,!" "Gotham" and many other shows have made use of local scenery. And before the fall gets under way, there’s even more: Comedy Central will film a pilot for Chioke Nassor’s Storytime this Tuesday, September 13. Storytime first debuted in 2013 as a web series on the website Above Average. Celebrated alumni of the production include Saturday Night Live’s Sasheer Zamata, Eric Andre (of The Eric Andre Show), Chris Gethard (of The Chris Gethard Show), and Maria Bamford, aka Netflix's "Lady Dynamite." Production sources were unable to share details about which actors would appear in the Bushwick scene; it could be one of the greats, or other talent still on the way up, so either way, keep your eyes peeled if you pass the location tomorrow. The premise of the show is straightforward, and hilarious: comedians tell their favorite personal stories as if presenting them to a friend, while playing every character in their own re-enactments. The Comedy Central version of the show will include a live audience component, where the host and comedians will delve deeper into the stories while sitting at a round table. Storytime will be filming at East Williamsburg’s The Stepping Razor Barbershop, located on Flushing across from Bogart, and at the BP gas station near the Morgan Avenue stop on the L train, so celebrities or no, be forwarned that you may have to navigate around the production tomorrow if your commute takes you through the area. An older episode of Storytime, featuring comedian Sasheer Zamata. So come Tuesday September 13, the east side of Flushing Avenue between roughly Central and Wilson avenues from 6 a.m. until 11 p.m.will be blocked off and cars will need to park elsewhere. Prepare to have bragging rights when the show airs, Bushwick! 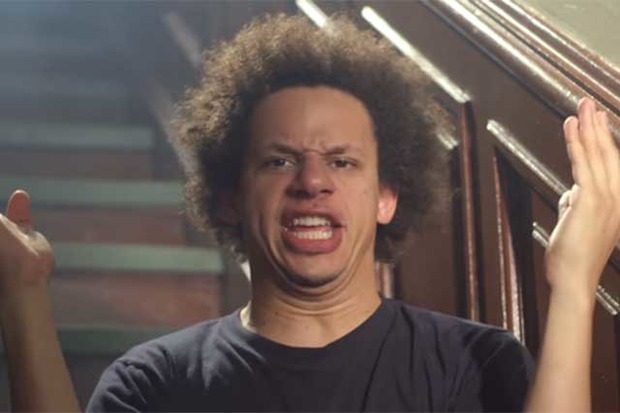 Featured image: Eric Andre recounts a misadventure. Image courtesy of Above Average.